For some reason that was never adequately explained, Hasbro stopped distribution of their Real American Hero Generation 3 figures early in 2009 - only one series shipped first quarter, with at least one more series left outstanding and released only as one of those "Philippines exclusives" we've talked about before. It was a shame, too, because there were a whole bunch of Resolute figures waiting to be released. Never ones to let a mold go to waste, Hasbro has just released a seven-pack of Resolute Joes. Snake-Eyes is a dedicated member of the GI Joe team, but he is forced to put a personal issue first when his archenemy Storm Shadow raises their rivalry to a deadly new level. The GI Joe commando confronts the Cobra ninja in a duel that originated many years ago, when they were friends in a ninja school that taught the Seven Steps to the Sun, a lethal martial arts sequence. Snake-Eyes has never revealed how many of these steps he learned... and the answer to this question will determine who lives and who dies in this final duel. The cancellation of the Resolute toys is the reason fans went crazy for City Strike Snake-Eyes from the movie line: it was the same mold, just given new colors and accessories. If the real figure was never going to come out, they'd make do with the next best thing. Of course, now the real figure's out, so expect City Strike SE prices to drop. The sculpt really captures the animated style, though we'd really be remiss if we didn't mention the paint. As we pointed out before, Snake-Eyes' uniform should be one solid color, but it should also be dark. This figure is a light grey, which makes him look like his clothes faded in the wash. His gloves, belt and hipster chinstrap beard are the color everything should have been, the body is the color the shoulder and kneepads should have been, and overall every color seems one step "off" from where it should be. And why are his goggles green? The body may be something we already have, but the accessories are new. Oh, he's still got the tiny backpack, and the sword in the scabbard across his belt, but he also comes with a new (to him) rifle, and the coolest accessory in this set: a personal glider. Remember in the show when he went to the Arashikage compound? It's not exactly the same design, but it's clear this is meant to fill the same role. It's a backpack, with two spring-loaded arms that pop out at the touch of a button; a hand swivels at the end of each arm, and the "wings" are real cloth. 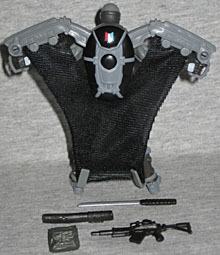 Two plastic clips attach to the figure's ankles, providing stability. Overall, a really great design. Beachhead has one goal: to do his best. That's what infuses everything he says and does. He focuses on the task he's been given and ignores anything that doesn't help him complete it. When things go bad, he channels his anger and frustration into fuel to help him go further and fight harder. He pushes himself to exceed his personal best and be an example to others, such as running ten miles every morning in blizzards, heat waves and anything in between. Along with Sgt. Stalker and Roadblock, he deploys to the jungle to rescue hostages held by Destro and Baroness. That bio sounds like they're trying to reconcile the RAH filecard (which said he doesn't get angry because he sees it as a waste of time) with the Sunbow animated series (where he regularly blew his top). Not that anyone was staying up at nights trying to figure out how they could both be true, but this is a pretty simple solution, and considering that Resolute is set up almost like an unofficial sequel to the '80s cartoon, it's a nice nod. Beachhead gets most of his body from the solo-carded Duke, which is a phrase you're going to hear a lot of in this review. His torso is fairly undetailed, like a smooth t-shirt; Duke had a high collar, but that wouldn't work for Beach, due to the lower edge of his mask - it's a separate piece held in place by the head. The mask is a new piece, surprisingly. They could have easily reused one of the existing heads: it's not like one green ski mask looks that different from any other. The figure doesn't have a lot of accessories, but what he does have is nice. He gets the standard Dave Johnson-designed rifle, painted green and silver. To make up for his plain shirt, he's got an absolutely killer tactical vest, based directly on the animation model. It's grey, with lots of pouches and ammo pockets, and the clasps are painted silver. There's a sheath on one of the shoulder straps, and a knife that really fits inside. The pistol on his left leg can't be removed from its holster. A leader is always in the position of making the tough calls and hard decisions. Duke, as the head of the GI Joe team, understands the burden of leadership all too well. When it's the duty of the team to respond to a threat against the world, Duke must be the one to make sure that the priorities are clear: the mission comes first and everything else comes a distant second. He demands a lot from his team, but doesn't ask anything of them that he isn't willing to give himself. His hard-won experience and unflinching determination have earned him the respect and loyalty of his team. This is the third version of Duke, making him the most prolific Resolute character. Unexpected! Usually it's Snake-Eyes who takes the lead, but hey, times change, and today's kids must want a hero who can, you know, "speak." We referred to the box set Duke as wearing his artic gear, but that wasn't quite accurate: this version is much more in line with the cartoon. 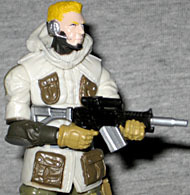 The figure uses Arctic Snake-Eyes' torso, giving him a long coat and a hood. The arms and legs come from the box set, but the head is entirely new. It's sculpted with the headgear and radio mic seen in the cartoon, and all the other flaws have been corrected: this is the first face unquestionably created from the model sheets, rather than just being a recycled movie sculpt. It makes him look a bit older, but that's fine. 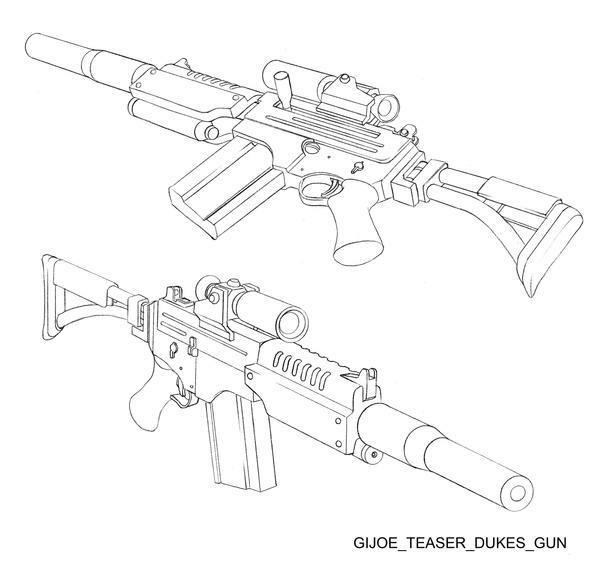 Duke's only accessories are a "Resolute rifle" and a simple pistol. He was wearing a brown backpack in this scene, but it's not included in this set. For some reason, there's a bit of a flaw with his articulation: despite the fact that his neck is a balljoint, the head will only turn side to side, not up and down. Maybe carving a little plastic from the inside would fix it. Flint is a classical scholar and graduate of the Airborne School, Ranger School, Special Forces School and Flight Warrant Officers School. He brings a broad intellectual background as well as finely honed technical skills and tactical knowledge to the GI Joe team. A thorough and meticulous planner, he had led many dangerous and complex missions in the field and overseen them from the team's base. His arrogance may be irritating at times, but it comes from firsthand experience, rock-solid skills and extensive knowledge. As the team disperses around the globe and into space to stop Cobra, Flint advises them all from the team's base. As a Rhodes Scholar, Flint is probably one of the smartest members of the Joe team - or at least, the best educated. And it's kind of amusing that another of the smarties was his girlfriend, Lady Jaye. How sweet that they found each other! Flint's Resolute is a nice update of the '80s look. 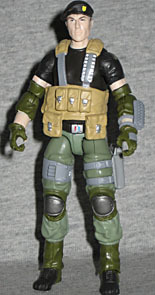 He starts with the same base body as Beachhead, but is painted with a black shirt and green pants. The gloves and other accents are darker green, and the pads or silver or gray. The face is a definite improvement over the G3 Flint - he no longer looks like an emaciated old man. Surprisingly, though, his hair is grey - what's up with that? Flint has his trademark I-12 riot shotgun, and ammo for it is sculpted on his mustard yellow webgear. Another small rack of shells is mounted on his left forearm, a feature none of the other figures have. The set includes a few extra guns and knives you can distribute at your leisure, and we've chosen to give him a knife: see, although you know Flint's name as "Dashiell Faireborn," (or "Faireborne," on this filecard), he was originally going to be named Dashiell Fairbairn, after the guy who helped develop a famous knife; thus, assigning him a blade just seems appropriate. A brilliant mind, outstanding martial arts skills, and lethal accuracy with her trademark crossbow - that's Scarlett. The G.I. Joe Team's counter-intelligence expert has the cerebral savvy to get inside the mind of her enemies and design a plot that'll outsmart them at their own game. She's also got the combat skills to take on a squad of Cobra troopers and be the sole person left standing when the fighting's over. She can make a HALO dive into hostile territory in the dead of night, then enter a heavily guarded Cobra missile silo and take it over as one-half of a two-person unit, and not even break a sweat. That's skill. That's training. That's Scarlett. Scarlett's come a long way from her origins as the Joes' token female - hell, Larry Hama's preliminary filecard listed her MOS (military occupational specialty - i.e. her "job" in the Army) as "girl." Classy. Today she's a full-fledged warrior, though, so let's hear it for progress. Scarlett's uniform has received only a minor change: it's still a grey bodysuit with a yellow thing worn over it, but rather than a unitard, that yellow thing is a shaped plate of armor that covers her chest and back. The grey has a blue tint to it, but the suit itself looks to be a thicker material than the pajamas she used to wear. As expected, her legs come from Helix. The face is surprisingly mannish, which is definitely not a feature from the cartoon. Her hair sculpt pushes the head down a little bit, but the way her eyes are painted keep her looking straight ahead, so that's nice. We get Scarlett's familiar crossbow, but it's a new sculpt and painted very nicely. The stock is black, and the rest of it is grey. The stave (that's the bow part) is removable, held in place in the packaging by a rubberband that I'm leaving in place because it looks nice. Note, please, that there is no firing pin. She has a knife sculpted onto her shoulder, and there's a sniper rifle of some sort in the package beside her. Is it hers? Sure, why not? The bullets painted on its stock get their own gold paint apps. He's a gourmet cook who can wield his hand-ground, carbon-steel cook's knife and his M2 .50 caliber "Ma Deuce" Browning heavy machine gun with equal skill. He wanted to be a chef and attend the Escoffier School in France, when a recruiter signed him up with the promise that the army would train him to be a cook. He later joined the G.I. Joe team, where, on any given day, he can whip up haute cuisine for the team - and mince anything in his path with a barrage of gunfire. Cobra gives him plenty of opportunity to perfect his skill with the Browning, as the evil organization spreads its vile presence from the snowy north to the town of Springfield. 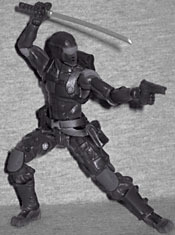 Like Snake-Eyes, the Resolute Roadblock mold was released in the movie line - but far fewer people ever got it, because A) it was a Wal*Mart exclusive, and 2) it was in an overpriced battle pack with the lamest Tripwire repaint ever. Still, fans raced to buy it, fearing the real version would never see release. To be sure, though, this version is much better! Roadblock is a big guy, easily the largest figure in this set at 4⅜", but he's not as wide as his cartoon counterpart - his skin's much darker, too. They gave him the proper kind of beard, but in general, the drive to untoon these characters is to their detriment. 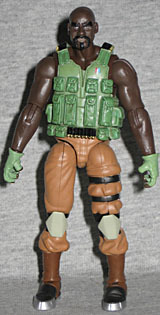 Roadblock is sculpted barechested and wearing orange pants, and his green vest is heavy with sculpted detail, including pouches, stitches and bullets. Bullets? Maybe the sniper rifle belongs to him instead of Scarlett after all! 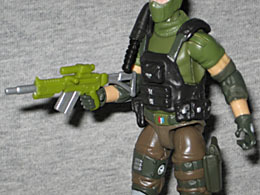 In addition to the removable vest, and excluding the mystery rifle, Roadblock has his heavy machine gun. It's definitely not the M2 mentioned on his filecard, but it's a huge beast of a gun and so suits him perfectly. 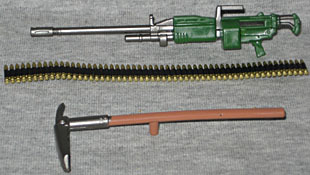 It's painted green and silver, and has a slot to feed the included ammo belt through. He also includes a... thing. It looks like an entrenching tool, for some reason, but the handle is two-to-three times as long as it should be. There's even a peg that allows it to plug into his back. He certainly never used anything like it on the cartoon, so why did Hasbro make it? The survival instincts of Sgt. Stalker were honed at an early age on the mean streets of his hometown. The lessons he learned may have been tough, but they made him a fierce warrior. It doesn't matter if he's facing two or twenty Cobra troopers; he'll make every one of them wish they'd never gotten out of bed that morning. Ranger trained and Airborne qualified, Sgt. Stalker uses his skills, training and instinct to adapt his actions to the changing situation. He heads to the jungle with Roadblock and Beachhead to rescue hostages held by Destro and Baroness, and teaches that arrogant duo not to underestimate the GI Joe team ever again. Yes, the "jungle." He heads to the "jungle" with Roadblock and Beachhead. The "jungle" that just so happens to be in Alaska, near the HAARP facility they were actually trying to get into. That jungle. They also had Gung-Ho with them, but he doesn't get name-checked on the filecard? Why, just because he's not in this box set? That seems kind of mean. Stalker has the same legs as everybody else, but changes things up by sharing Snake-Eyes' torso and arms. In the cartoon he was wearing a turtleneck, so he's got the same piece that Beach wore around his neck. He has the same dark skin as Roadblock, but it works better in his case, because that's how he was actually animated. He's still wearing his beret - the most drastic change was the addition of shoulder-length dreadlocks pulled back into a ponytail. Weird! Stalker has a Resolute rifle, done in the same green as his uniform. He has new webgear, with a knife on the right side - same knife as Beachhead, but not the same gear. There's also some inexplicable giant missile included in the tray next to him; it looks like an oversized mortar round, but it's not based on anything seen in the cartoon, so what's the deal? The Resolute sets are sold in those long boxes that Hasbro has used for several G3 exclusives. The figures are all lined up in a single tray, and the set includes filecards and display stands for all of them - except in my case, the base that should say "Sgt. Stalker" instead says "Sgt. Slaughter," so obviously someone grabbed the wrong one from the bin. Whoops! The backdrop behind the figures is the same that was in the five-pack, showing the Cobra jungle bunker from the "Now You Know" short used to announce the series. The only thing that's really bad about this set is that you have to pay $40 for each pack, and you can only get them online; basically, the fact that Hasbro left us hanging in the first half of 2009. All these figures were due for release one way or another, and it would have been great if they'd made it out the door in their intended forms.